Anywhere in Iceland with visitors and a ready supply of stones soon develops a rash of cairns. These vary from a few stones balanced on a handy boulder to impressive structures over two metres tall. All cairns seem to be an implicit request to add more stones. But what most cairns lack is any indication of who created them, when and why. This small cairn is different! This cairn was created by Michele and Stephen at 18:17 UTC (GMT) on 2009-08-14 to celebrate the joys of overland travel. 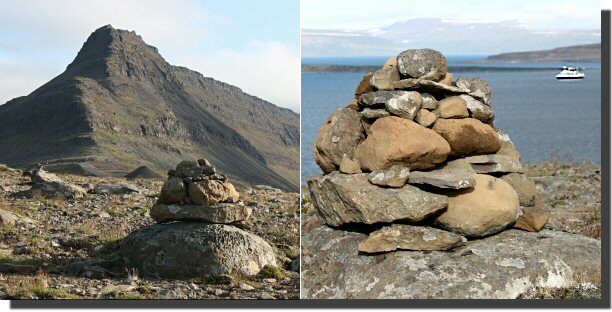 If you would like to add a stone to this cairn you can find it at the end of the Hattardalsfjall peninsular at N66.04469 W22.94184. There is a very good wild camp nearby. The photo above was taken at 22:40, it was cold outside. Home - This page last changed on 2009-08-16.